Up-to-date bus schedules and maps for the Société de Transport de l'Outaouais. 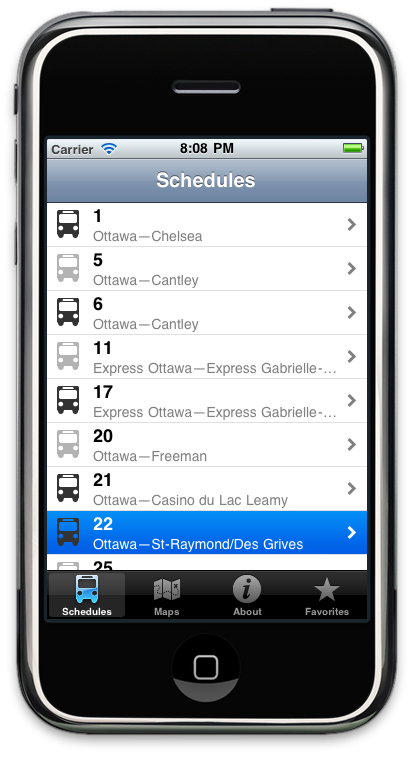 This application contains schedules and maps for all the STO buses. All the data is contained in the application and will self-update as the STO publishes new schedule information. Designed for your iPhone or iPod Touch: no network is necessary to use it. Save your favorite buses, maps and stops for easy access. My name is Philippe Casgrain and I wrote STO Synchro. I occasionally blog about software development topics at developer.casgrain.com.